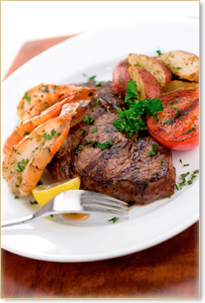 Dinner Menus - A Tasteful Affair: Extraordinary Catering, serving the San Francisco Bay Area. Need help planning an upcoming dinner event? Give us a call today at 925-485-3288. Located in Pleasanton, CA. Catering the entire Bay Area. Packages include serving pieces, china, flatware, glassware, water carafes, linen napkins, and coffee service. Service staff are available at an hourly rate. * Five hour staffing minimum. "Thank you for going the extra mile on our special day. We are still hearing comments on the wonderful food!" "Your staff was very presentable and enjoyable to work with. The presentation of the food was beautiful. And the food was outstanding!" "We would like to thank you for such a wonderful job. We got great feedback from everyone on the food and the service. You will be recommended to everyone we know. Thank you." "Just wanted to say thanks again and let you know how much we truly enjoyed your services and your company!" "Wonderful food and wonderful service. Everyone really enjoyed the event. Thanks." "Thank you again for all your hard work on Saturday night. The party was a great success and I thank you and your staff. I look forward to working with you again." "I wanted to let you all know how much we enjoyed the food for my husband's retirement party in June at the Senior Center. You were all a joy to work with and I felt like I've known you all my life." "This is a long overdue thank you for delivery on an amazing dinner! All four of you were a joy to have in my house. :) The food was absolutely delicious and everyone was raving about it." "Thank you so much for your delicious food at our wedding on May 20th. It was quite delicious, beautifully set up, and the smoked salmon hors d'oeuvres were an unexpected treat!" "The food was terrific, the presentation was out of this world, and all the staff was fabulous! You gave the chamber members a mixer to remember!!" The owner, general manager and executive chef have over 25 years of combined experience in the food service industry. We love what we do and we are dedicated to providing the finest gourmet catering at reasonable prices. We can help eliminate the stress of planning an event. Just fill out the form with as many of the pertinent details as you can and we will contact you within 48 hours to discuss your event. Absolutely! We love to help you create a special menu just for your party. All of the menus on this website are customizeable. You are welcome to make any additions or changes that you would prefer. Need help planning your upcoming event? A Tasteful Affair has got you covered! We have put together a few different planning guides to assist you with any hors d'oeuvre, beverage, staffing, and wedding questions you may have. (925) 485-3288 © Copyright 2014. All rights reserved.